Understanding the work context of future system users is essential in requirements engineering. It is particularly crucial when developing ubiquitous systems that react on context changes. This paper discusses the need for in-situ requirements elicitation approaches to build mobile and context-aware systems. We identify three different levels of support: The first level covers contextual techniques without tool support. Second level support is based on existing RE approaches and mobile tools. Third level support utilizes context-aware tools receiving context-specific information to guide analysts in the field. These tools enhance requirements gathering for ubiquitous systems. We present a context-aware tool prototype for on-site scenario walkthroughs and discuss how the underlying scenario-based approach needs to be adapted. Our tool-based approach was tested in an initial evaluation study. 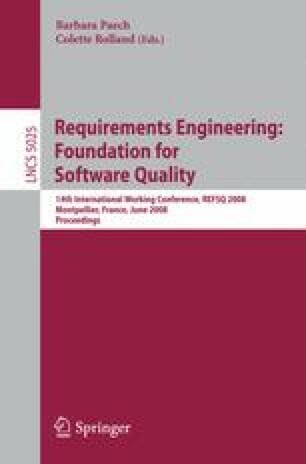 Finally, the paper presents requirements for RE approaches supporting ubiquitous system development based on lessons learned from using level II and III tools.